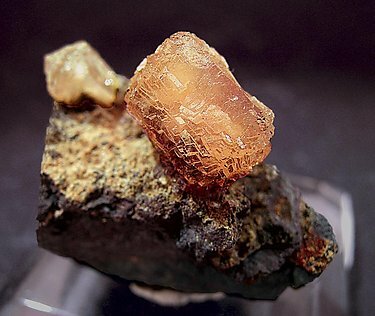 Doubly terminated crystal on matrix. It is very individualized, translucent, bright and with a good color, with fine polycrystalline growths on the surface of its faces. A novelty of Munich 2008. The sample forms globular growths of well defined terminations of crystals. The deeper color is similar to the older pieces, classified then as Poldervaartite. Excellent color, perfection, and esthetic: the form is really nice, it looks like a snowman. A exclusive and funny thing. Excellent miniature. The prismatic crystals are similar to a wheatsheaf with good brilliance and color. On rocky matrix. 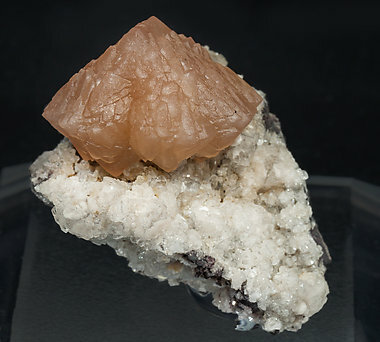 Two complex crystals placed on their matrix to give a very aerial sample. It stands out for the sharpness of the crystal form, which is prismatic and double–pyramid, which is not that common in Kuruman. 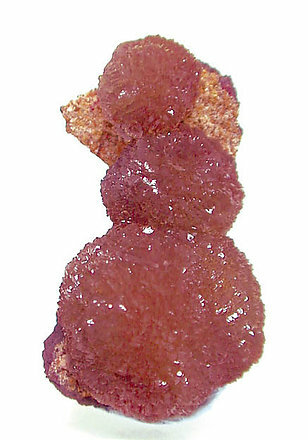 While the color is a little less intense than other samples it is compensated for by the intense brilliance, which is due to the large number of flat faces on the crystals. 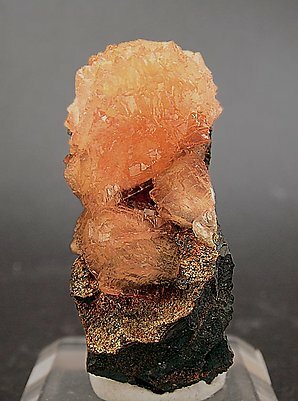 This one stands out for the crystalline terminations, pyramidal and in complex groups that give it a spherical look, and the sharpness of the forms of the prismatic faces. Both the color and brilliance are magnificent. The position of the group on the matrix makes it very esthetic and adds the definitive touch. Two photos showing its spectacular color change. Just minor matrix on its rear, almost a floater specimen complete in all sides with perfect form and excellent luster-color perfection. The crystals have a spherical form, they are gemmy and are formed by hundreds of small parallel grow crystals. A beauty!. 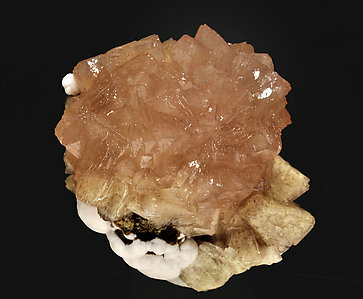 Complex and very aerial Olmiite crystal with parallel and polycrystalline growths, with very well defined faces and edges, translucent with a pink color changing to reddish in incandescent light. 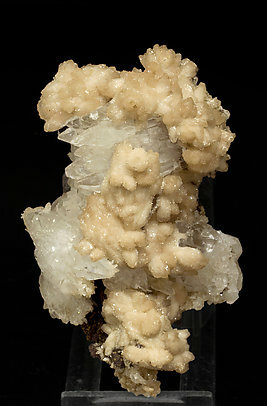 It is on matrix, with white Calcite crystals. 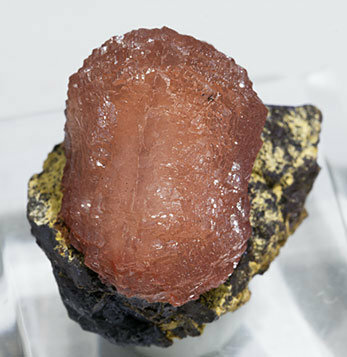 A very aerial Olmiite crystal with polycrystalline growths, with very well defined faces and edges, translucent with a pink color that changes to reddish under an incandescent light. 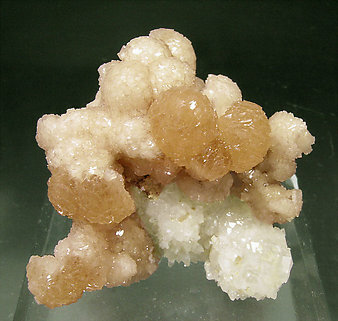 It is on matrix, with white Calcite crystals. Recently new Olmiites were found in N'chwaning. The color is a little more orange than the first ones, and the crystals are a little bit smaller. 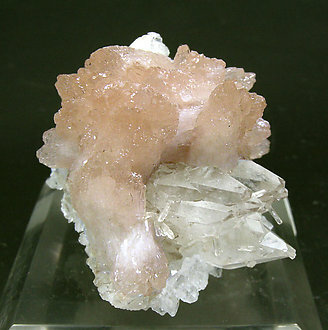 But these ones are on a matrix of small crystals of gemmy Calcite, making the whole specimen esthetically pleasing. The prices are also lower than they were for the first ones, so we think they are a good deal. 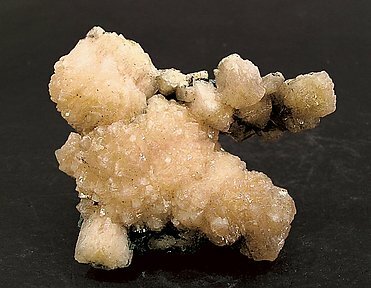 In this case the crystals of Poldervaarite are well positioned on the matrix, nicely separated, aerial, and have good contrast with the matrix. A novelty of Tucson 2009. Unusual groups of crystals of irregular contour, more or less oval-shaped. They are pink, and more intense on the terminations. They are on very acute scalenohedrons of Calcite and on matrix. They have come from a single geode. 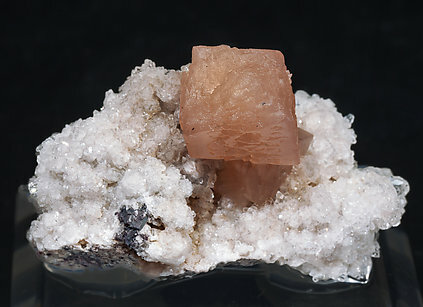 At first we believed they could be Poldervaartite due to the presence of the accompanying Calcite and the pinkish color of the crystals, but the analysis confirms that they are Olmiite (the manganoan end of the series) and not Poldervaartite (the calcian end). We’ll send a copy of the analysis to the buyer of the sample. 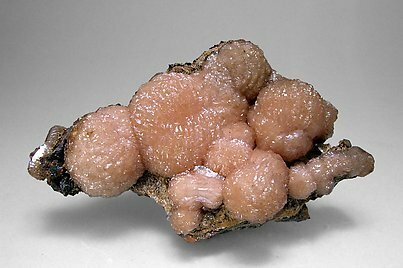 Splendid and not common association of Olmiite, forming groups of bright crystals, slightly pinkish, with very acute scalenohedral crystals of Calcite that are colorless, transparent and extraordinarily bright. One of the best pieces from this find. 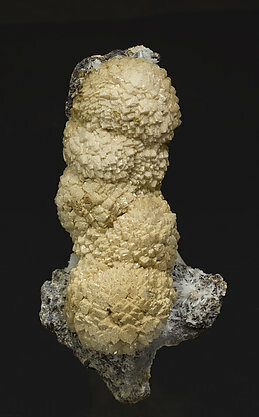 Globular growths of Olmiite crystals of unusual appearance, with very well defined faces and edges, of clear brown color and very bright. 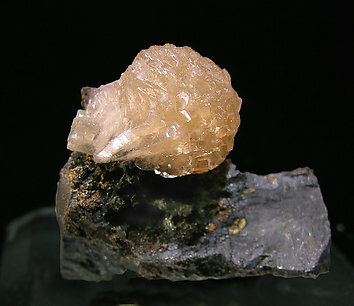 On matrix, with associated acicular crystals of Celestine. 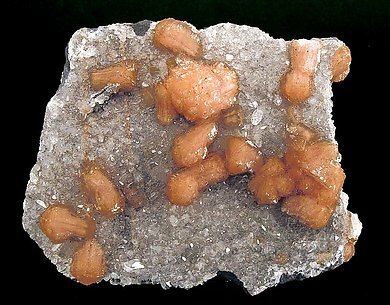 Globular growths of small crystals of Olmiite whose faces are very well defined and very bright, with two degrees of color, clear cream in some areas and slightly orange in others. On matrix, with small crystals of white Quartz. Group of extraordinarily well defined crystals with a dominant orthorhombic prism. A large size for the species, they are translucent and bright and have an excellent reddish color, deeper than usual in this kind of sample. An exceptional specimen.